Chop up the butternut squash into chunks and put it in a roasting tin—then toss in the 2 tablespoons of olive oil. This should go in a hot (200C) oven for about 40 minutes. I blasted the aubergines in a hot oven along with the butternut squash—but if you’re following the recipe, then they should be burnt over a flame, or popped under a hot grill for 30 minutes. However you do it, the gist is that their skin should end up cracked and wrinkly, and their innards should be squishy. 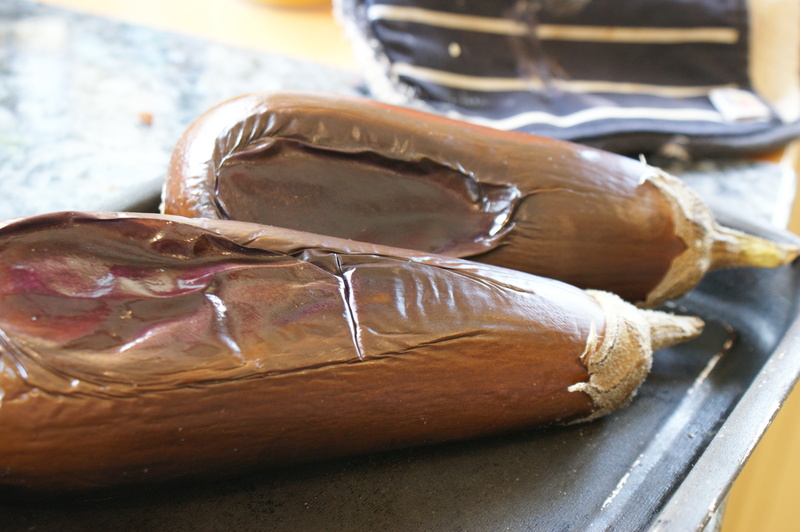 Peel them, and let the aubergine flesh drain in a colander for 10 minutes. Put it in a tub, and then whiz it with the yoghurt, oil, lemon juice and pomegranate molasses. Just a quick note though—I personally thought the pomegranate molasses made the sauce too sweet and sickly. I know it’s meant to add a hit of fruitiness, but if I were making it again, then I wouldn’t use the pomegranate. 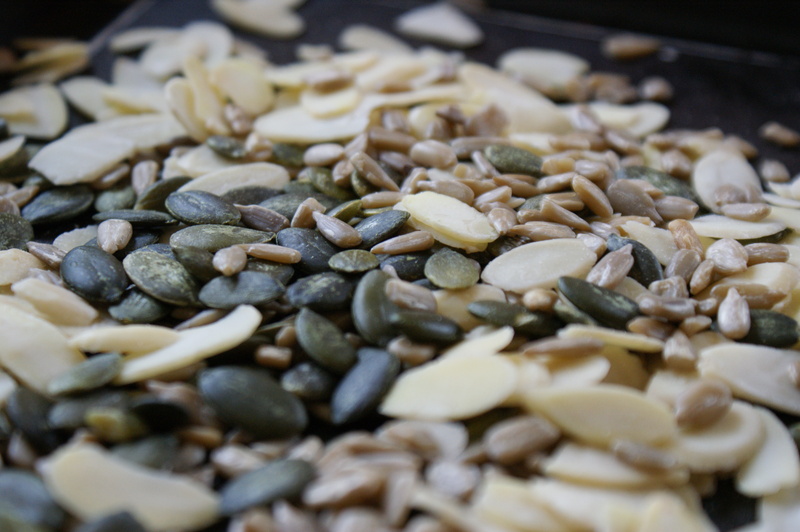 A few minutes before the end of cooking, pop all the seeds onto a roasting tray, and toast them until they’re browning. It’s always safest to use a timer to do this, because it’s so easy to get distracted and leave them in there. Start with the timer on 4 minutes – the likelihood is that they’ll need a little longer, but it’s better to undercook, and then pop them in for a bit longer rather than burn them straight off! 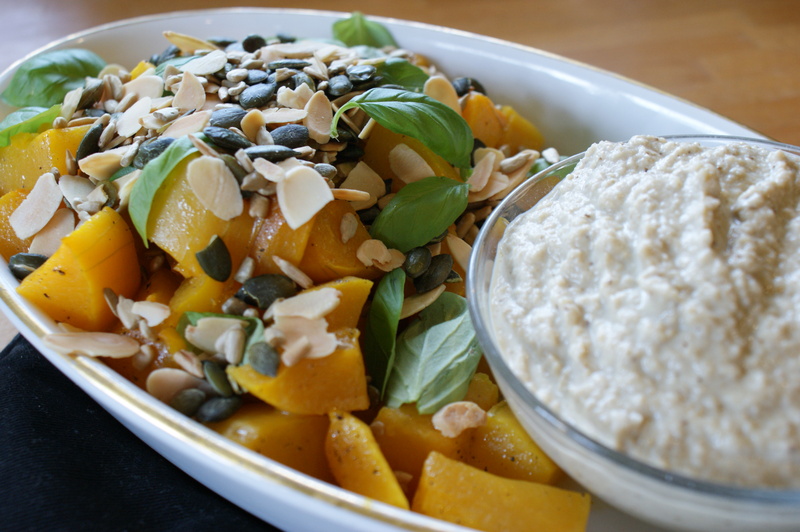 Tip the butternut squash into a serving dish, top with the nuts and then basil leaves. Finally, scoop a generous amount of the aubergine sauce into a side dish to serve. Delicious. A really tasty and very healthy vegetable side.